Alexandra assists clients in a wide range of divorce-related matters, including allocation of parental responsibilities, maintenance, child support, financial planning, asset division for high net worth individuals and post-decree issues. Alexandra received her undergraduate degree from Vanderbilt University, earning a Bachelor of Arts in political science. She attended DePaul University College of Law, graduating with a Certificate in Child and Family Law. 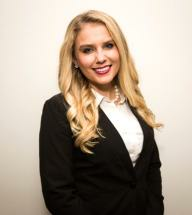 While at DePaul, Alexandra was a Schiller DuCanto & Fleck Family Law Center fellow and active in the formation of DePaul’s Child and Family Law Association. Alexandra also participated in DePaul University’s Family Law Clinic, where she used her 711 law student license to represent clients in both dissolution of marriage and domestic violence proceedings. Alexandra has always held an interest and appreciation for family law and continually pursued every opportunity for further her experience in the field during her time in law school. Alexandra was a Law Clerk at Lake Toback DiDomenico before becoming an attorney, and held an externship with the Domestic Violence Legal Clinic, using her 711 law student license to assist domestic violence victims in obtaining Orders of Protection. Her passion and dedication to the area of law transcends into continually representing the best interests of her clients in the most efficient and effective manner. Alexandra is admitted to practice in Illinois and is a founding member of the Illinois Chapter of the American Association of Financial Litigators, an active member of the Chicago Bar Association, Illinois State Bar Association and Armenian Bar Association.